We are capable of catering to the customers situated anywhere and we are located in Zanjan(Iran (Islamic Republic of)). With excellent storage facility, we can effortlessly fulfill urgent and massive requirements of the customers. Also, we maintain complete records of the delivered products. 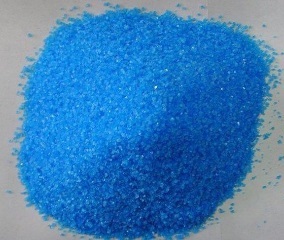 Description :Copper sulfate pentahydrate is a fungicide Another application is cheshunt compound, a mixture of copper sulfate and ammonium carbonate used in horticulture to prevent damping off in seedlings.